KIEV, Ukraine -- Vladimir Putin continues to chip away at Ukraine while the west just watches. In the past year, Ukraine has lost 9% of its territory, 1.3 million people have fled Russian-occupied regions, 6,600 people have died and 30,000 have been wounded. 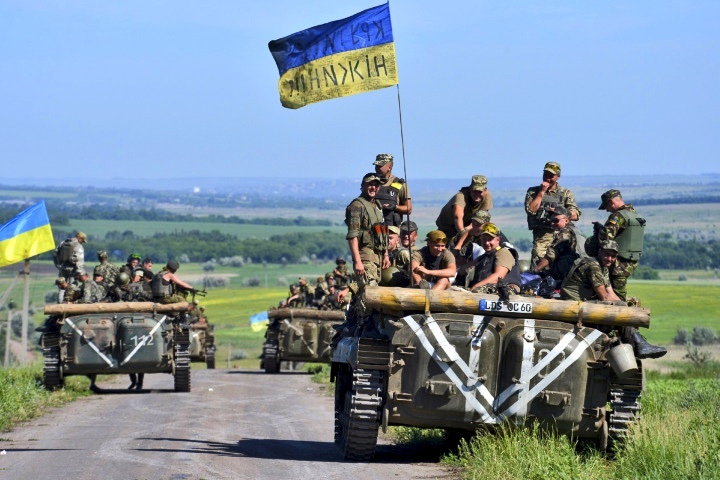 Members of the Ukrainian armed forces ride armored vehicles in the Donetsk region of Ukraine on June 9. On July 17, one year ago, Russian missiles blew up a Malaysian plane over Ukraine, killing 298 passengers on board, a war crime barely mentioned. Ukraine’s economy has been damaged and the country’s payments on debts, due to years of exorbitant Russian gas prices, are the same as defense costs. Russia’s aggression is at bay because, in the absence of military aid from the west, thousands of volunteers have armed themselves to help their rag-tag army. President Obama and Europe worry that arming Ukraine will provide Putin with a pretext to escalate the war. But Putin has never needed pretexts to rough up the neighbors. Without modern weaponry and funds, Ukraine is a knife in a gunfight. Take the example of 19-year-old “Maley” who went to the front last year, equipped with his grandfather’s hunting rifle and a steel plate that his mother bought strapped to his chest. He joined a volunteer brigade of roughly 10,000 fighters and became a sniper. In April, he was wounded on patrol when an army medic behind him stepped on a land mine and lost both her legs. “She didn’t pay attention. I’m going back,” he said, a copy of “American Sniper” beside his hospital bed. There’s growing pressure to arm Ukraine. Last month, Senator John McCain (R-Ariz.) visited and 40 bipartisan congressional leaders are coming this month. “This is shameful that we will not provide [the Ukrainians] with weapons to defend themselves. They are fighting with 20th-century weapons against Russia’s 21st-century weapons. That’s not a fair fight,” said McCain in a press conference on June 20 in Kiev. “The struggle in Ukraine is more serious than ISIS,” said John Herbst in an interview. He’s a former US ambassador to Ukraine and Uzbekistan and fellow at the Atlantic Council in Washington. Ukrainians have staged two revolutions — in 2004 and 2014 — to unseat Russian puppets. The question on the mind of most Ukranians is — will they have to fight a third? “Does the US only help oil countries?” said an exasperated Natalie Jaresco, Ukraine’s minister of finance and an American from Chicago.